A fine copy in the scarce dust jacket. Q is for Queen. 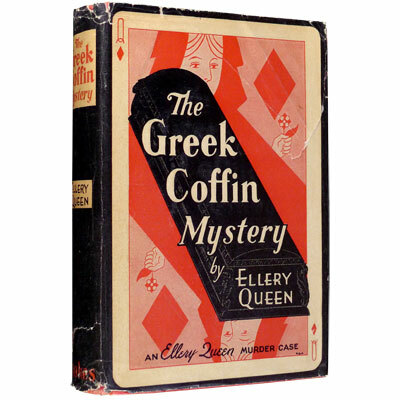 Ellery Queen is a fictional detective regarded by many as the definitive American detective-hero, rivaling Nero Wolfe as the successor to Sherlock Holmes. Ellery Queen, and later Barnaby Ross, was the pseudonym shared by the writing team composed of cousins Frederick Dannay and Manfred B. Lee. Together, the pair wrote four Drury Lane mystery novels, starring a Shakespearean actor and detective, as well as the Ellery Queen mystery series. The pseudonym pair was all the rage in the 1920s and ‘30s, with one of the cousins, usually Dannay, donning a mask and appearing in public as Ellery Queen. The cousins carried on a fictional dialogue as Ross and Queen in print and ended the intrigue in 1932 when Ross was revealed to be Ellery Queen. Several years later, when the writers behind the pseudonyms were unmasked, the public was so enamoured of them that their work continued to enjoy great popularity for decades to come. ‘After Poe, I think it’s true that Ellery Queen was the most significant and important writer of mystery fiction in America.’ – Otto Penzler. Provenance: Carl G. “Speed” Juisl (?). Reference: Penguin Random House. Julian Symons, 100 Best Crime & Mystery Books, Sunday Times (1957).